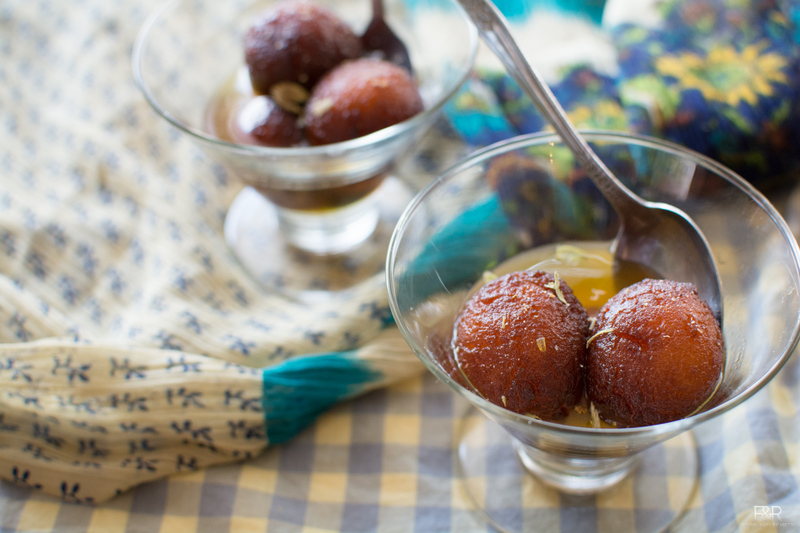 Gulab Jamun is the Indian mouth watering dessert which is very easy to make. Store brought readymade powder has refined oil. Here, however, we know our ingredients. Here we have two methods. To demonstrate 2 different methods, I have divided the mix into 2 parts. You can use the entirety of the mix for the method of your choice. I am giving the measurement for the entire mix. 1/2 cup self rising flour If you don’t have self rising flour you can make your own with ½maida (all purpose flour) and ¾ teaspoon baking powder. Mix these ingredients really well. Mix sugar and water in a large pan and bring it to boil. Now add cardamom and saffron, and let it boil for 5 more minutes. Turn off the heat and keep the syrup aside. Mix milk powder and self rising flour really well. Add the light whipping cream to the prepared jamun mix little by little and mix it. Consistency should be a medium hard dough. (If you are using heavy whipping cream, let the consistency be a little harder, so that you will get good jamuns). Keep this aside for 2 to 3 minutes. Add melted ghee to the mix. Mix well. Now add whole milk little by little to make the dough. Consistency should be slightly medium hard dough. Now we have the dough ready. Before making the balls, heat the oil in a pan on a medium low heat. Amount of oil should enough for the jamuns to completely dipped in. Now take a small amount of dough and roll it into a ball. Keep these balls ready. Now take the jamuns out and transfer them onto a paper towel. Once they have cooled down, transfer it to the prepared sugar syrup. Repeat the same procedure for the remaining dough.